Cushion your bodySpace-age foam molded directly over the frame. Ensures optimum comfort with an additional pad of soft space-age foam. Ensures an attractive look and Super-soft polyester fiber cushions your body. Durable flexo springs and steel frame make superior resilience and continuous support. Plus system provides continuous support for your head and lower back. Double-sided mechanism ensures maximum stability and functionality. Genuine top-grain leather or fabric covers the entire seat, provide a luxurious look and feel. 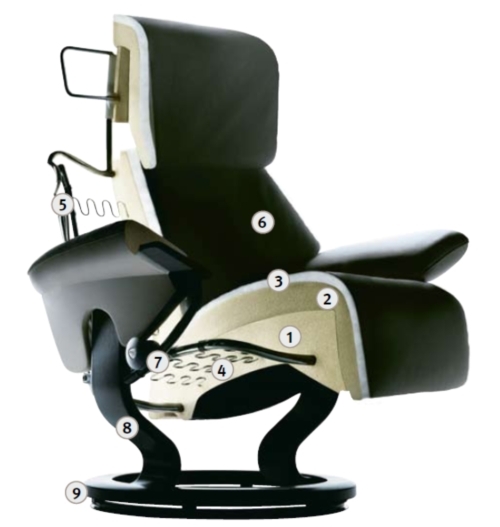 Unique Stressless Glide system automatically adjusts to your body weight and movements. Two-stem base adds superior stability. Swivel actions lets you easily turn 360 for maximum mobility.